Custom made to Order. Fleece Skirts ship every 1-2 weeks via USPS Priority Mail. While I started out using my fleece skirt primarily on rafting trips, I soon learned that a fleece skirt is great for skiing. 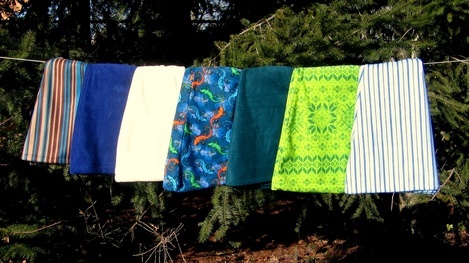 Born on the Rogue River, the fleece skirt idea came on a rainy day at camp. I'd worn plenty of fleece on the river and I loved wearing skirts on the river. So I made myself a fleece skirt. As I began to wear my fleece skirt on trips, friends and clients started to ask me to make them a fleece skirt. So gradually as I was making more and more fleece skirts, I started Cold River Fleece Skirts. Still very small in scale, each fleece skirt is custom made. Your fleece skirt may be an outdoor layer piece for you. Or you may use your fleece skirt in town or city. I hope you will enjoy your fleece skirt for a long time. Fleece skirts wash well and hold up great over time. The quick drying nature is great in snow and rain. However, I wear my fleece skirt most often in summer. Pulling it on in the evenings, when a fleece skirt is just the right thing.